A highly attractive, intricately carved modern cuckoo. 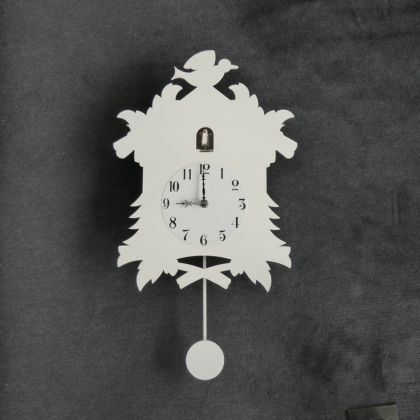 This clock makes a “cuckoo” sound on the hour. At 1 o’clock one “cuckoo”, at 2 o’clock two “cuckoos” etc. A MIN/MAX button allows you to control the volume of the bird call which is automatically switched off from 10 pm until 5 am so as not to disturb your sleep. Height: 390 mm with the pendulum extending a further 140 mm.